We are extremely happy and proud to welcome Donald Bain to Deckarhuset/TheCrimeHouse! Donald Bain is the author of over one hundred books, many of them bestsellers! 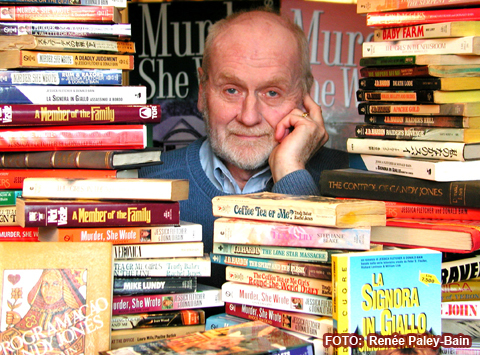 Since 1989 he has written over 30 original mysteries featuring Jessica Fletcher in the Murder, She Wrote book series! We must begin by asking: How did you end up being “Jessica Fletcher’s” partner for the Murder, She Wrote book series? My agent called me in 1988 to see whether I’d be interested in writing a tie-in novel based upon the extremely popular TV show. The textbook publisher McGraw-Hill had decided to establish a fiction imprint and had purchased the rights from MCA-Universal to publish the book. (It’s now NBC-Universal). McGraw-Hill was interested in me because of a long-running series of Washington-based political/thrillers/murder mysteries I’d been ghostwriting for the byline of a well-known person. (More about that in answer to a later question). I signed on to write the novel which I titled Gin & Daggers. While many of the TV episodes were set in Jessica Fletcher’s fictitious Maine town of Cabot Cove, it was decided to set the first book in a foreign locale. I chose London, a favorite city of mine and one I knew quite well. I watched many of the TV shows, and when I felt confident that I had the character down I started writing. The book was published in hardcover in 1989 and received wonderful reviews. Avon brought out a paperback edition, and the British publisher Michael Joseph followed with its own hardcover version. Although the contract with McGraw-Hill was for one book, the success of Gin & Daggers raised the possibility of a series. But McGraw-Hill suddenly decided to fold its fiction imprint, and it appeared that there wouldn’t be more novels bearing the “Murder, She Wrote” banner. But in 1993 Signet, a division of Penguin, decided to publish original murder mystery novels based upon the show, purchased the rights from MCA-Universal, and signed me to write four more. I should point out that none of the books in the series is based upon any of the TV episodes. Each book is an original murder mystery using the characters from the show. Today, there are now more than 4.5 million copies of the books in print and each title is still available through bookstores and online. Back in 1989 when Gin & Daggers, the first book in the series, came out did you ever suspect that you still would be writing books for the series in 2010(!)? Absolutely not, and I still wonder at it. When Signet offered its first four-book contract I fully expected it to be the last. But here I am today, 21 years later, working on book number 37, the final one on the current four-book contract. There are two novels already written and due to be published in 2011, Skating on Thin Ice (set in the world of big-time competitive figure skating), and The Fine Art of Murder (which deals with art theft and forgeries in Italy). My wife, Renée Paley-Bain, a fine writer, began collaborating with me on the books a few years back and has added a new dimension to the stories. That she’s a skater provided a useful and colorful insider’s view of the sport for Skating on Thin Ice. The series is obviously financially successful for the publisher. Were it not I’m sure they would have long ago stopped offering new contracts every two years. I’m assuming that the book I’m currently writing, number 37, will be the last. The fact that each book carries the byline Jessica Fletcher and Donald Bain gives the publisher the option to change writers at any time. Jessica, of course, exists only as a fictitious TV character played so beautifully on TV by Angela Lansbury. Will there be another contract? We’ll see. Do you have any personal favorites of the Murder, She Wrote books? I’m very place oriented, and the plot for each book begins with the setting in which Jessica will have to solve a murder—and avoid being killed herself. I suppose certain places are favorites and influence how I view books utilizing them. Because I’m of Scottish heritage I’m fond of The Highland Fling Murders that came out in 1997. Researching that book in my family’s hometown of Wick Scotland was a joy, as are all the trips we’ve taken to establish an understanding of the places used in the novels. Renée and I are reluctant to write about a place that we haven’t personally experienced, although a couple of the novels were written without that advantage. I loved the premise and ending of Trick or Treachery which naturally revolves around our Halloween tradition. The book just published in October, The Queen’s Jewels, is certainly a favorite be cause it takes place on the magnificent Queen Mary 2 during a trans-Atlantic crossing, an experience we personally enjoyed in preparation for writing the novel. The biggest selling book in the series was Murder on the QE2; sales figures indicate that The Queen’s Jewels might top that. The Tv-series is famous for its constant change of scenery. The book series seams to be following the same pattern, any chance of a future novel taking place in Sweden? As I mention in my previous answer I’m extremely place oriented. It’s interesting how our readership responds to taking Jessica away from Cabot Cove. Many of them prefer that she stay home, and that the books take a more “cozy” approach. Others love traveling with her to far-flung places. I’d love to set one of the future books in Sweden, which now seems to be firmly established as the epicenter of today’s murder mystery genre. If a new contract is tendered, Sweden will be high on our list of possible scrims against which Jessica finds herself once again up to her neck in bodies. You have written 24 books that you are prohibited from publicly taking credit for. Does this ever bug you? Ghostwriting is a two-edged sword. When I book I’ve ghosted receives rave reviews and appears on leading best seller lists, I admit to wishing that my involvement as the writer was known beyond family, friends, people in publishing, accountant, lawyer, and my mortgage-holder. On the other hand when a book I’ve ghosted gets a bad review, and doesn’t do well in the marketplace, it’s the other person’s name that takes the rap in public. I’ve been in situations where a book I’ve ghosted is discussed by people who don’t know of my involvement. Sometimes I’m asked whether I’ve read the book in question and what I thought of it. Naturally, I always say that I enjoyed it very much, thought it was well-written, and then promptly break from the group in search of a drink. By the way, I’ve ghosted many other books besides the 24 novels set in Washington, D.C., includin g non-fiction books for business leaders. …What special qualities do you believe a good ghost writer must possess? The number one quality is an intact ego, and an ability to work closely with someone else. Most of my ghostwriting and collaborations have gone smoothly. A few haven’t, and when I sense it isn’t going well, I’m quick to bail out. It’s also important to want to write the best possible book even if my name won’t be appearing on it. I approach every writing project with the philosophy that it’s the most important thing I’ll ever write, and possibly the last. Above all else I want to be recognized as a professional. I’m extremely busy at the moment and loving every minute of it. The “Murder, She Wrote” novel Renee and I are currently writing is set in Bermuda and carries the tentative title Blood on a Pink Beach. That’s due to the publisher in April. I’m also ghosting another Washington-based thriller that’s due next May, and am collaborating with a close friend and wonderful thriller writer, Craig Thomas, whose Firefox novel was a major motion picture starring and directed by Clint Eastwood. Craig, who lives in Bath, England with his wife and editor Jill, had dropped out of commercial fiction for a while but I’ve coaxed him back into the saddle. Renée and I have also edited a wonderful comic caper novel, Taking Tennessee to Hart, by a friend and my former drama teacher at Purdue University, Joe Stockdale, and are seeking a publisher for it. So, all in all, 2011 sha pes up as a busy time for us. We wouldn’t have it any other way.